This week’s Meet the Millsapian is Ruby Delaney, who has been a part of the Millsaps community for more than 19 years. Photo courtesy of Bailey Smith. Ruby Delaney, a native of Jackson, Miss., is an important asset to Millsaps College. 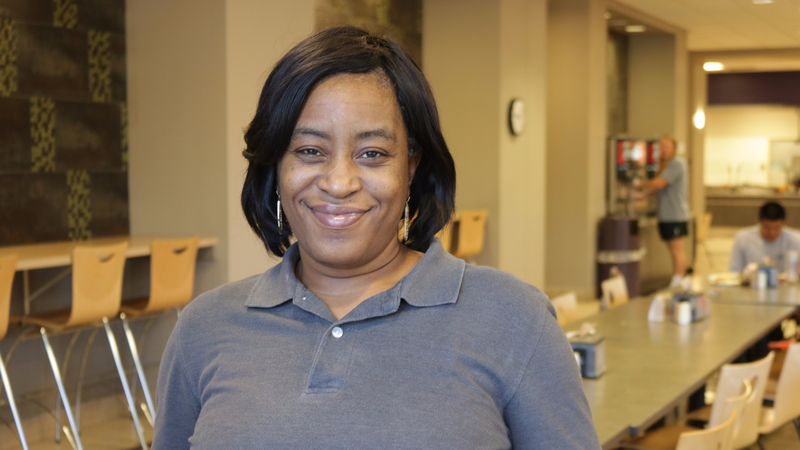 She has been here for almost as long as many of the students have been alive, and on any given day, you can find her in the cafeteria greeting students with smiles and love. In her free time, she enjoys exercising and listening to R&B and gospel music. The Purple and White: What’s your favorite part of working at Millsaps? Ruby Delaney: You guys. The coming in of the students, the smiles… You guys come in and greet me every morning and keep my day going. P&W: How do you establish such strong connections with the students? RD: It’s always something I’ve wanted to do. You know, from day one when I started working here, I wanted to learn names. I feel like that’s just a part of me. P&W: I’ve noticed that. When I came to Millsaps, I told my mom that there was a lady here with the same name (as her) and that you guys reminded me of each other. But what has been the weirdest situation you’ve encountered since working here? RD: There’s been a lot of them. One time a bird flew in the cafeteria on top of my head. I was fanning and students kept asking if I was okay and I was like “There’s a bird on top of my head.” That was the weirdest experience. P&W: If any, what changes would you make in your workplace? RD: There aren’t any that have to do with me. I’ll leave that up to the supervisors, but there are none that I would make. P&W: What’s your favorite thing to do when you’re not on campus? RD: Grandbaby duties. I’m always with my grandchild—spending time with her. That’s what it’s all about when I’m not working. P&W: That’s so sweet. Are there any goals that you’re looking to achieve in the coming months? RD: To bring everyone in this cafeteria together as one… for everything to be L-O-V-E. No sugar coating, that’s it. That’s my goal. P&W: Describe yourself in one sentence. RD: Ms. Ruby is fabulous, sensational, friendly and good-spirited. The Purple and White thanks Ms. Ruby for taking the time to answer these questions! If you or someone you know would like to be the next “Meet the Millsapian,” you can email me at clevecd@millsaps.edu. Ms. Ruby was one of my favorite parts of the Caf! She really did always greet us with a smile, and remembered our names! I still think she says hello if we pass each other during Homecoming weekend. Keep up the great work, Ms. Ruby!